2009. 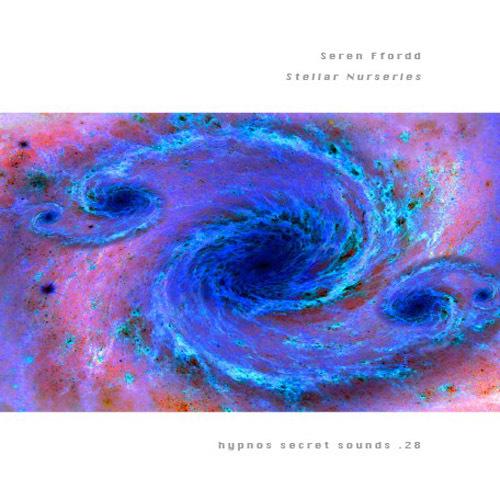 Stellar Nurseries is the first in a series of Seren Ffordd reissues planned to continue over the coming year or so. These recordings, by an artist whose work is always mysterious and sometimes ominous, were previously released on the Umbra and Penumbra labels operated (by Hypnos artist Oophoi) out of Italy, though the artist himself resides in Wales. He first connected with Hypnos on the compilation CD Sounds of a Universe Overheard, to which he contributed a track, and Hypnos Secret Sounds released his album Veils, Shadows. This recording exhibits a pleasing serenity, a great example of the artist's characteristic combination of dark and light elements into a balanced, deep contrast. Floating in the depths of space are vast clouds of molecular gases. They drift until disturbed by the dance of gravity. Then, folding in on themselves they spiral in towards the centre, to the forming Starseed. As the disc gets denser and hotter the gases spiral faster and faster, an awesome storm of movement. Faster, denser, hotter until the star ignites, flaming into being. A wave of light and heat flares out into space, pushing the lighter elements before it. The heavier materials left are once more pulled by the bonding of movement and gravity. Held by the dream of the star the planets begin to form in their orbits. Once born the planets spiral round and round creating new notes chords and harmonies.